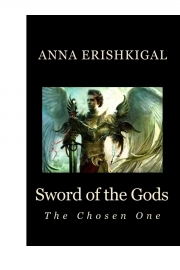 Description of "Sword of the Gods: The Chosen One (eBook)"
Mikhail awakens, mortally wounded, in his crashed ship. The woman who saves his life has abilities which seem familiar, but with no memory of his past, he can't remember why! With his ship destroyed and a shattered wing, he has no choice but to integrate into her village, a task made difficult by her jilted lover. Ninsianna's people have prophecies of a winged champion, a Sword of the Gods who will raise armies from the dust and defend her people against an Evil One. Mikhail insists he is no demi-god, but her dark premonitions and his uncanny ability to kill say otherwise. Even without the technology destroyed along with his ship, the sword he carries is a weapon of mass destruction to a people who still throw sticks and stones. When young women start to disappear, Mikhail must organize her people to fight back against an enemy who remains unseen. Reviews of "Sword of the Gods: The Chosen One (eBook)"